Photograph of the last portrait done of the artist’s father, Lejb Lejzerowicz, 1869-1943 or 44. The portrait is now lost. 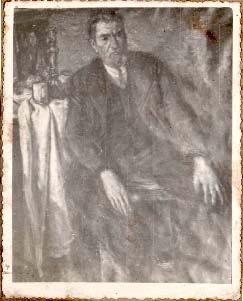 Lejzerowicz wrote a note in Polish in the margin attesting to the fact that it was the final picture of his father: “Portret mego Ojca ostatni malowany w Ghetcie.” Yad Vashem Photo Archives, 7950/1. Gift of Tobias Rozynès, Lyon, via Gérard Mayer.